This is a Portugese Mauser 1904/14 Bolthead. I bought one out of curiosity because I couldn't help notice that it looked exactly like the elusive Gewehr 1888 Commission Rifle Bolthead. When I got it, it was pretty damn close! The overall length is very close, the outter diameter is exact, the firing pin channel is exact, and the bolthead retaining lug is exact. 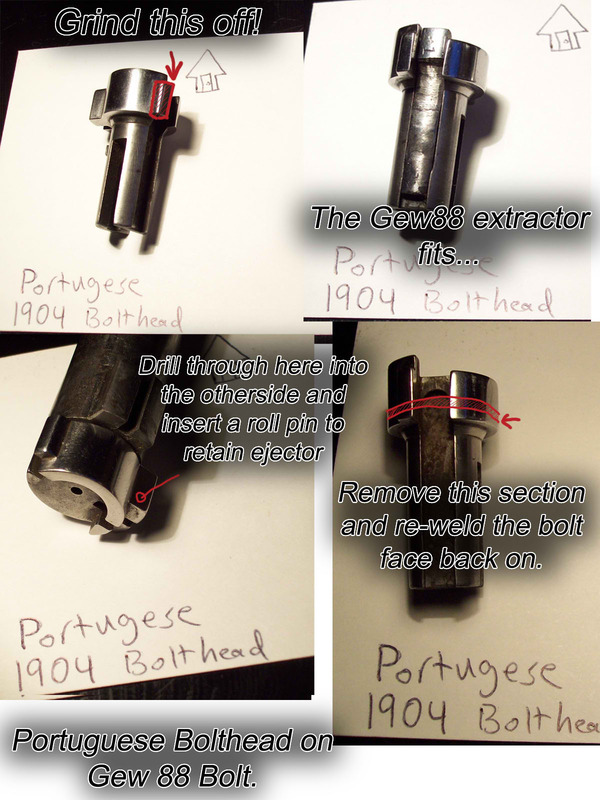 There are a few noticeable differences though, such as the headpiece being a tad too long, a protrusion sticking out of the right side, and lastly there is no retainer for the ejector (I believe the Portugese 1904 uses a standard Mauser ejector or something similar). I think these could be easily fixed with a little millwork (ahem, Dremel!). Judge for yourself! I'm pretty sure that is all there is to it. I don't know how much material you'll need to remove as I was just guessing. I'm gonna buy another and have at it with a Dremel. I don't have access to a welder, but I'll try and rig something up! Update (10-Nov-2014): I keep getting random spikes of web traffic every once in a while and my recent site statistics tell me it's because of this post. Just for posterity I should mention I never actually bothered to do any of the mods - it looks like way too much trouble than it's worth and I don't have the skill to reweld such a tiny piece of metal. Even if you use a milling machine to shorten the front portion, it still wouldn't work since the extractor groove is way too forward on a Portugese than on a Gew88. You would probably need a custom extractor. Also I have to wonder if the firing pin hole would open up after re-milling out the bolt face. I suppose you could just plug it up and redrill the firing pin hole. 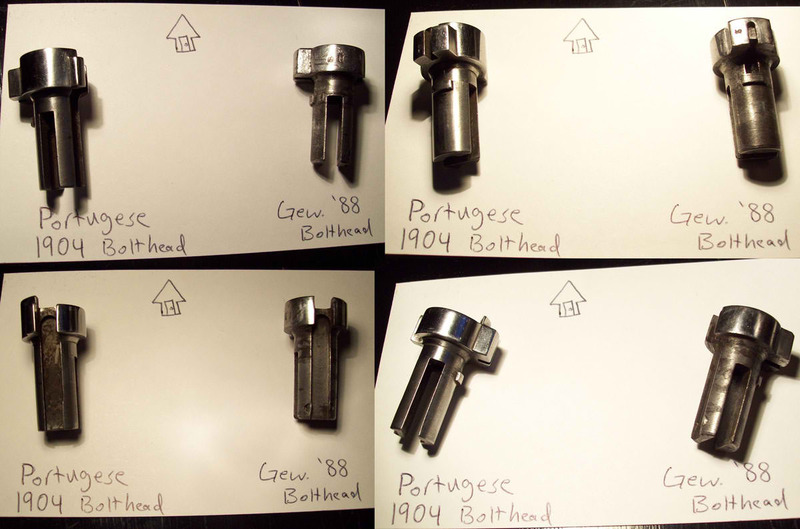 Anyways, I see Gew88 boltheads on ebay every once in a while and they sell anywhere from $50 for a new reproduction (minus the extractor and ejector) to $120 for a complete used specimen.